Cold and quiet, world of snow." -Hazel Hutchins, Ben's Snow Song: A Winter Picnic (1987). As a Forest School educator, I am often asked about the curriculum for our program. At Wild Roots Nature and Forest School, we plan our daily sessions, but because we take an inquiry-based approach, our emergent curriculum is built on our preschoolers' natural curiosity. Preschoolers learn best through hands-on direct experience. Our session plans allow our students to explore natural loose parts and tools, hike through various trails in the forest and build up to participating in activities like making a campfire. 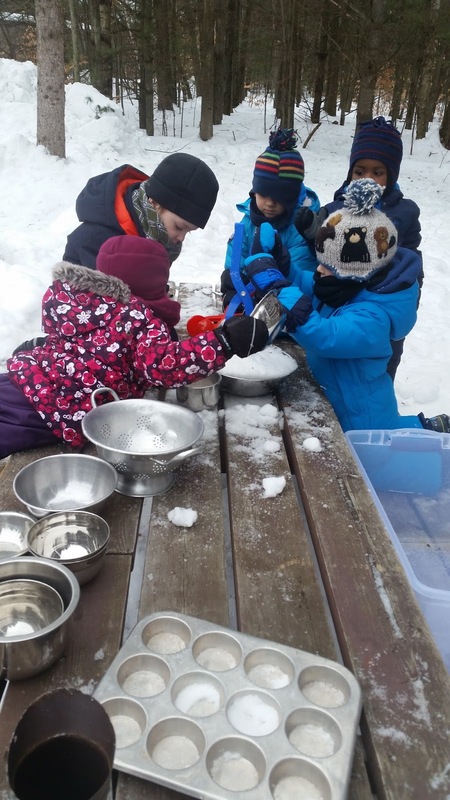 Our students are learning through free play in nature and exploring their own interests. Sometimes, I actively participate in their exploration and other times, when my students are engaged in an activity or play, my role is to step back and observe. Later, I document my observations and use my notes to enhance future session plans. 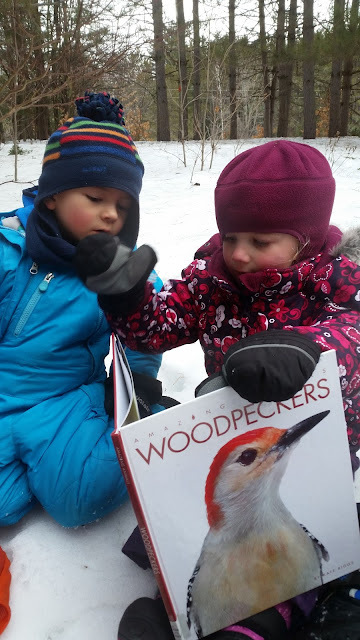 Last week, our students heard a woodpecker in the woods and there was interest in learning more about the bird. 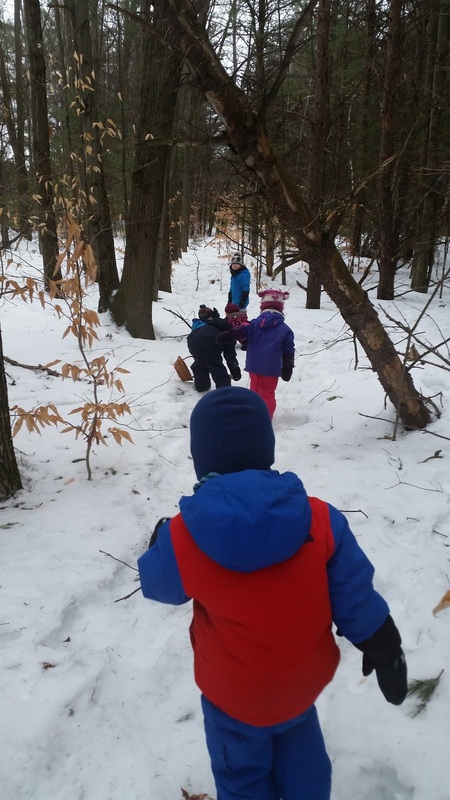 This week, when I asked my group what they wanted to explore at Forest School, my group decided they wanted to hike the "Pine Path" to see if we could spot our feathered friend again. I had come prepared with more information and pictures of woodpeckers for the preschoolers to look through, in case the opportunity should arise. We didn't end up seeing or hearing a woodpecker this week, but our discussion led to more questions about how birds stay warm in the winter. We talked about how on cold days, birds fluff up to trap air in their feathers. I explained how the air acts as insulation to keep the birds warm. "Just like our winter jackets keep us warm!" exclaimed one preschooler. And with that, my little birds were off on a new adventure in the woods. 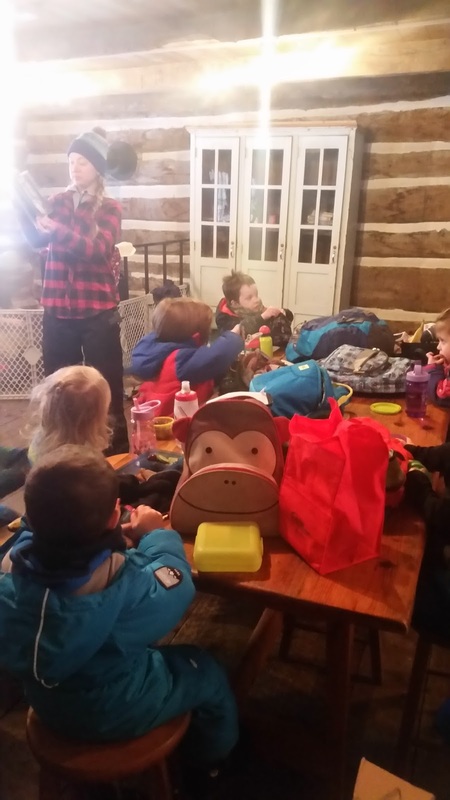 In the winter, we head inside our cozy cabin for snack time. Our preschoolers always request a story. Some students listen to the stories as they sit at the table eating their snacks, while others get comfortable on our wool mats, wrapped in fleece blankets. Today, we read "Ben's Snow Song: A Winter Picnic". We sang as we hiked to the open field today. 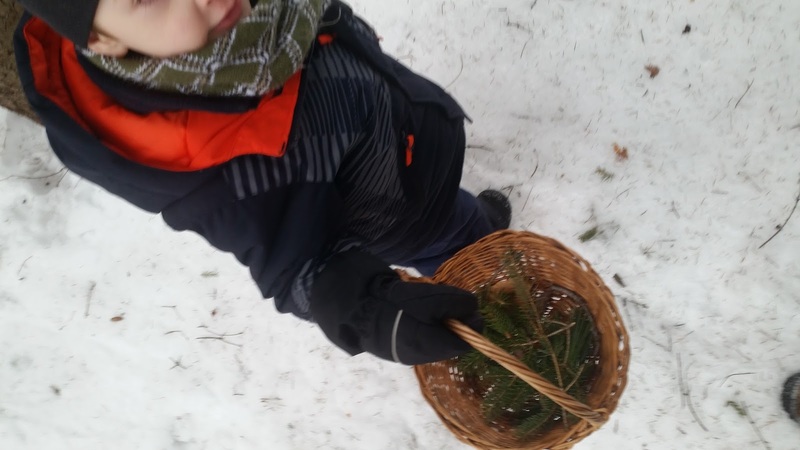 Some students collected forest treasures in their baskets along the way. 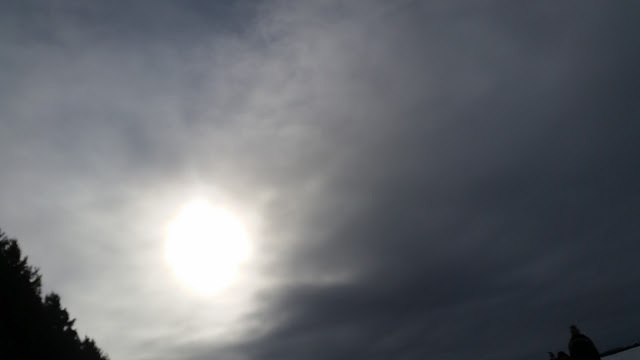 When we arrived, the kids sat in the snow for a break and gazed up at the sky. "What do you think the clouds are made of?" I asked. "Clouds are made of water and ice," answered one preschooler. "No, clouds are made of marshmallows," corrected another student. This quiet activity allowed the preschoolers to simply sit and imagine. Soon the children were up and running around the field again. There was more imaginative play on the theme of family this week. 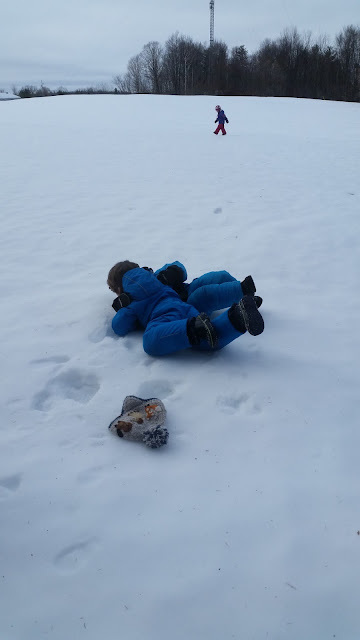 Meanwhile, a small group of boys participated in some safe rough and tumble play. 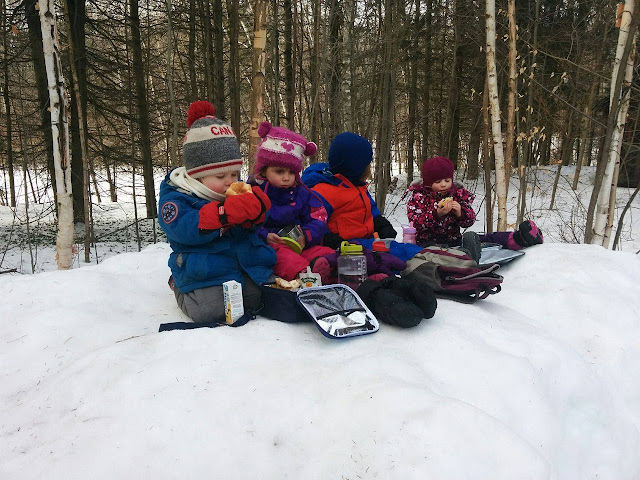 Later, the children requested to have a winter picnic for their second snack-just like in the book they had read earlier that morning! Our second session wrapped up with a cooking show in our "Snow Kitchen". 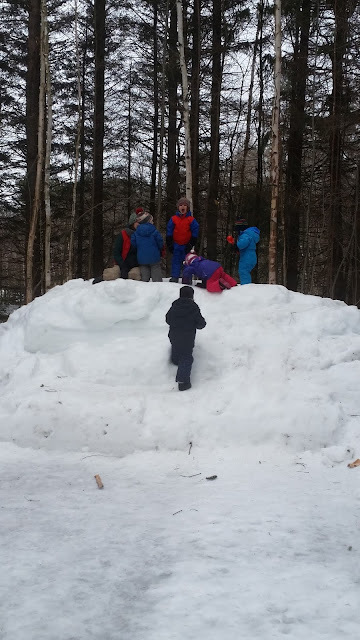 And one final game of snow monster on our ski hill. It is such a pleasure to explore, create and learn along side my amazing Forest School students.